Last week I paid a visit to Wil Blaauw (AE-Europe). 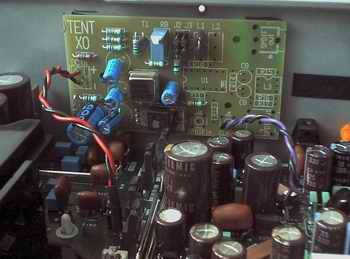 I was in need for a powertransformer and two supply chokes for a poweramplifier that I'm building for a friend of my. When I came there and was talking to Wil, the subject came to sacd. When I told Wil that I was not familiar with sacd, he told me he was extremely positive about this new "standard". At his concern he had a Sony SCD XB-940 standing around, not even hooked up to a system! 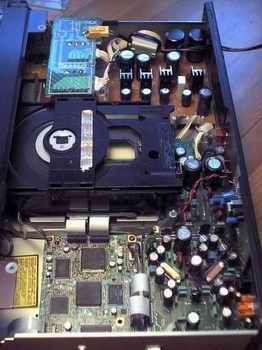 "Now is my chance", I thought, and asked him if I could borrow this machine for a while to get to know sacd. Wil, friendly as always, immediately gave me the player and said that he was curious about my experience in sacd. Along came a sacd from Patricia Barber (Cafè blue) which I also have on "normal" cd. That's nice! I think a good comparison can be made this way, listening A - B and v.v. Furthermore I don't own any sacd's, why should I?. The player went home with me and I put it in my audiorack. At first I had to make a modification to my preamp, because I've always had only one source to listen to, therefore no need in a source selector. Well, now I've made one! (can also be used for my upcoming phono preamp, wich will be ready in a while). Since I didn't know how long this player had not been playing, I let the total installation play "warm" for a couple of hours. I can tell you, those were long waiting hours! When I finally took place on "the sweetspot" to listen to the differences in sacd and cd, I was really curious! I say differences between sacd and cd on purpose, because a direct comparison between my Cyrus Disc & Dacmaster and this "budget" Sony is not the issue here. Regarding to hints of some friends of my, things were about to happen! By the way, my cd-combo is modified: analogue output section has been replaced by a Sowter step-up and the pcb's are C37 treated. 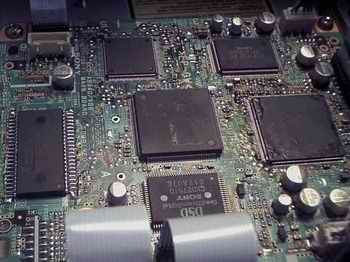 The Sony has also a modification: a better anti-jitter clock was built in, a clock by Guido Tent. This, I know the result of , as I have modified some players using this clock: Not a mere improvement but way better! Clik here for more information. Well, how does it sound? This is good! Immediately you can here the improvement in freqeuncy response by sacd. More fine detail on anything, especially in "space". Does this Sony out-perform my cd-combo? No! My player sounds more natural, has more dynamics, a bigger stage and less harsh highs... Happy about that? Not really... You must take into mind that this Sony is a budget player. I find it hard to believe that this budget player almost equals my player, which was reference several years ago. I've read some articles about modifying this Sony, not only the clock, but also replacing the analogue output stage by the same Sowter I use in my own player. This is quite easy done: just connect the primaries to the Pulse-Dac's and the secondaries to the (added) outputs. Then it is possible to listen to both outputs! You can read about this at: www.gydotron.com.....(is in Dutch, clear pictures though lots of bytes...). One thing to keep in mind is, that a transformer is picky to the load seen: stick to factory advice here! A incorrect load really sounds bad and will even cause a loss in step-up ratio! So: Things didn't really happen.... But I must admit that if this player was a somewhat more expensive (more audiophile) sacd player, it definitely would have been playing better than mine (that is: cd versus sacd)! I also think that this medium is to be seen as an extra; in this player the "cd-section" is really budget. If I had this player for keepers, I would substitute the analogue part and think that it can really play very, very good! What is also to be mentioned, is that in my quest for sacd, I could not succeed in the local stores... If they had some titles on sacd, it was not possible to listen to them. Most of the owners however, told me that sacd was not more than a hype, and would not last for long... That means that you're almost totally dependent to the internet. First download music to listen too, then order it. 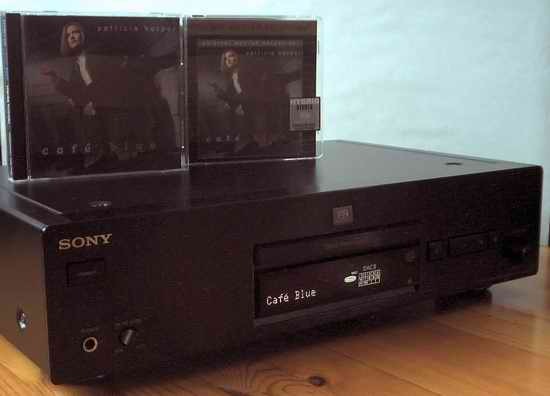 Price differences between cd and sacd are about 3 Euros, so that's not an issue... By the way: Have you ever listened to this Sony's "normal cd" output?. If Sony has made this output sounding so worse to emphasize the potential of sacd, they really did a good job! !